I LOVE my hometown. I have been lucky enough to travel, and there are still many places I wish to explore, but San Francisco, the City by the Bay, the place where I grew up, is still a subject of deep study for me. The City is always changing, always growing, always reinventing itself through the zeal of its residents. The City has some grand spaces. The sort of spaces that make you feel pity when you visit the quaint, tiny public buildings of small towns and suburbs. It's not just snobbery - it turns out that large groups of people working together CAN do a lot more than small groups of people working together can. Collective effort can be superior to individual effort! Also, urban people generally want more from their shared public space, more from the city they live in, than suburban folks, who seem to often want a refuge AWAY from society at large. People seeking refuge don't build massive libraries. They just don't. Which is why I'll never be a good suburbanite. When I show friends around town to show off our public buildings and other grand spaces, these are the places I take them to. 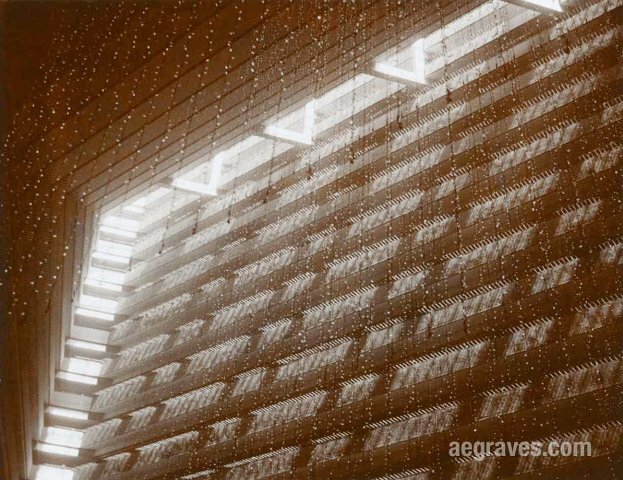 These are just detail views - your experience of the scale and light of these spaces must occur in person. The San Francisco Main Library (sfpl.org/) (image at top). This is still the "new" building to me, but it is an interesting one, with a huge, bright atrium, lots of comfortable desks, bridges across lightwells, and an amazing, abstract, sculptural magazine room. The art reference section is my favorite place to read. The wall paper on the upper floors is made entirely of the old card catalog cards, with handwriting annotating each in various colors with book text. 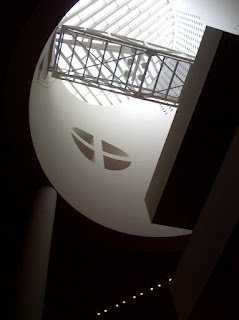 I highly recommend visiting the Herb Caen Magazines and Newspapers Center, a dazzling room up on the 5th floor, which has fabulous natural lighting, views down into the atrium, a sculptural stairwell, and ALSO a fabulous collection of magazines which spans across an open air bridge to more of the archive. This amazing public building, which includes the mayor's office, the offices of the board of supervisors, the county clerk, and many other city functions, includes brightly skylit courts, round openings between floors to let massive lights hang down grandly, marble-lined staircases, oak paneled courtrooms, and high-ceilings throughout the administrative spaces on the first floor. The views of the central spaces from the balconies are amazing. If you're lucky, you'll be there for one of the many weddings that takes place at the top of the grand staircase. 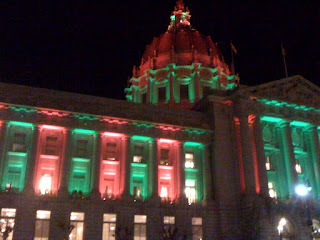 City Hall is open only on weekdays during business hours. Civic Center. 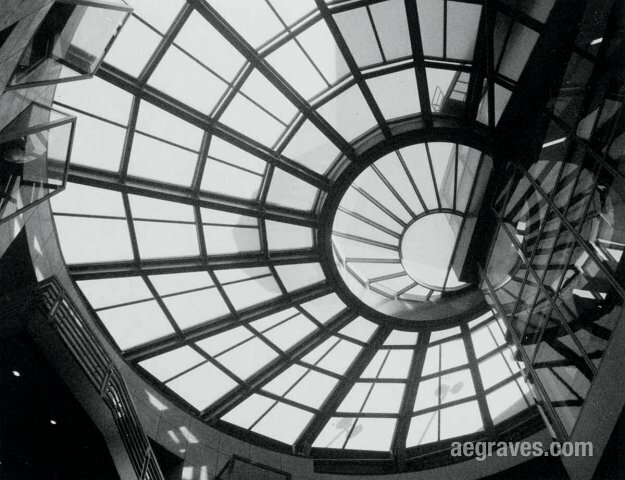 The Hyatt Regency atrium, Embarcadero center. This picture, my favorite of the room so far, doesn't quite give you a sense of its vast scale (though it does show you the lighting on one of those rare days when it lights the whole atrium just so). The room has balconies overhanging it in a way that gives people coming up in the escalators vertigo if they aren't cautious. It's like being inside a hollow pyramid on one side. There is also an amazing sculpture, a laminar flow fountain, and a posh bar. Lights hang down from above, both filling and calling your attention to the incredible volume of the room. You should go to the bar there, have a mojito, and contemplate the view from a comfortable couch. 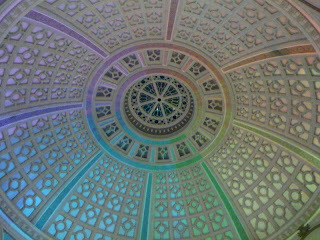 The old Emporium Dome in Westfield Center. To the extent you can bear to be stand in a high end mall, the room topped by this dome is charming. Along with the building's Market Street facade, it is the last remnant of a grand old department store that has since been modernized in polished stone, giant LCD screens, and overpriced purses. You can nearly smell the money... But the dome remains lovely, oh so high above the patterned floor. The movie theaters in the rear of this complex are pretty good, and the dome level has a wonderful Japanese stationery shop. Near Powell BART. The San Francisco Museum of Modern Art (SFMoMA) (sfmoma.org). This is possibly our most vibrant museum, which is good and bad: good, because it is doing well, bad because its success required that it close for a major expansion, which is thankfully complete. The museum not only has an amazing collection and a fun bookstore, but also two coffee shops AND two restaurants. Well, okay, they also have a theater that shows art films, a good website, and enjoyable parties. There. Be satisfied. Adjacent to Yerba Buena Gardens (between Powell and Montgomery BART stations). The San Francisco Ferry Building. This grand transit terminal was carved up into dingy little spaces for many years, and then revived through a remarkable renovation into a gorgeous public hall and luxury food court. Go for the bay views; stay for the food. Acme Bread! Acme Bread! Acme OLIVE Bread! Washed down with Blue Bottle Coffee. And possibly fresh chevre from Cowgirl Creamery on those rare days when I've stepped off the 'nearly vegan' wagon. At the bay's edge, in the northeastern corner of town, at Embarcardero BART.